All products are made in a gluten-free and nut-free environment that meet strict standards. They have been awarded certification by the Celiac Sprue Association. Creamy Mushroom Soup/Sauce Mix: Coconut Oil, Corn Syrup Solids (from Corn Starch), Food Starch- Modified (from Corn), Salt, Sodium Caseinate (from milk), Hydrolyzed Corn Protein, Pure Cane Sugar, Dried Mushrooms, Natural Mushroom Flavor, Dried Onion, Xanthan Gum, Spices (Celery & Black Pepper Extract), Dried Garlic. Cheese Sauce Mix: Cheese Blend (Cheddar and Dry Blue Cheese [Milk, Cheese Cultures, Salt, Enzymes], Whey, Soybean Oil, Lactose, Maltodextrin (from Corn), Sodium Phosphate, Citric Acid, Lactic Acid), Food Starch–Modified (from Corn), Whey Protein Concentrate, Salt, Annatto, Turmeric, Hydrolyzed Corn Protein. 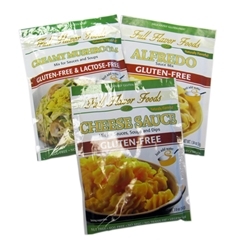 Alfredo Sauce Mix: Parmesan Cheese (Pasteurized Milk, Salt, Cheese Culture, Enzymes), Non-Fat Dry Milk, Modified Tapioca Starch, Salt, Hydrolyzed Corn Protein, Spices (Black Pepper & Celery Extract), Yeast Extract, Citric Acid, Caramelized Cane Sugar.